In the remote rainforests of Gabon, primate researcher Martha Robbins and her team have achieved an extraordinary feat. 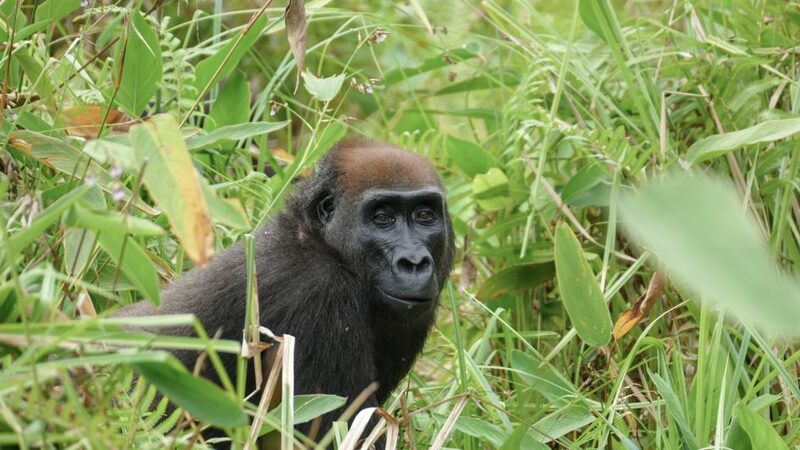 They have gained the trust of a group of wild, elusive Western Lowland Gorillas. Western Lowland Gorillas have been researched extensively in captivity but their behaviour in the wild has been a mystery. Shy by nature, the wild gorillas normally avoid close human contact – until now. An estimated 360,000 Western Lowland Gorillas live in the dense rainforests of western Africa close to rivers and swamps. Their populations are scattered across seven countries. Martha Robbins studies the 16 individuals of the Atananga gorilla group, within Gabon’s Loango National Park. Robbins is from Germany’s prestigious Max-Planck-Institute. For 15 years she and her team have monitored the group, amassing invaluable data. In the early days they kept their distance from the gorillas. As the team gained their trust, the Atananaga gorillas became more accepting. Martha Robbins and her team are not just focusing on the Western Lowland Gorillas, they want to contrast and compare their behaviour with that of the Mountain Gorillas that live in East Africa. There will be differences, because their habitats couldn’t be more different! Mountain gorillas prefer the high-altitude rainforests, the Western Lowland Gorillas inhabit diverse landscapes like coastal forest, savannah, swamp, lagoon, and even the beach. The researchers have already witnessed new behavioual traits! Fruits, plants and herbs are among the Western Lowland Gorillas favourite foods, but they are spread across the gorillas’ vast territory, so they must travel long distances to satisfy their tastes. In contrast, the Mountain Gorillas are more the stay at home type. All they need to sustain themselves is within easy reach. This difference in travel arrangements has impacted on their social behaviour. The Western Lowland Gorillas live in a less-closely knit society while the Mountain Gorillas are inseparable and far more tolerant. In Mountain Gorilla society, dominant silverbacks accept two or even more younger silverbacks. Western Lowland Gorilla group allow one dominant silverback. In ‘Gorillas Close Up” we transport viewers to Western Lowland Gorilla territory, inside one of Africa’s last remaining tropical wildernesses. We’ll follow researchers as they take us up close to these magnificent primates, inside immense tropical rainforests and to the pristine Atlantic coast where a host of other wild animals live. On secluded palm beaches forest elephants take leisurely strolls, red river hogs dig up the warm white sands in search of food and hippos take refreshing dips in the sea. This is the first blue-chip documentary about Western Lowland Gorillas, and the first time that the behaviour of this elusive species has ever been captured on film.